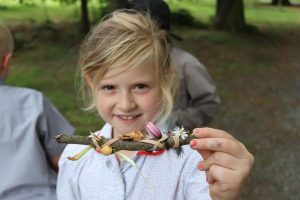 Ilkley Primary Ghyll Royd School continues to improve on its outdoor curriculum with its second Eco Schools Day. Children headed outside to enjoy various activities in the school’s seven acres of meadow and woodland. Eco Schools Day was attended by Mel France from the Woodland Trust. Ghyll Royd recently received Gold accreditation in the Trust’s Green Tree Schools Award scheme. Reception have impressed all year with their super spellings, reading and phonics work. Pupils were given a card with half a picture on and half a word. In a difficult scavenger hunt, the children had to find the missing piece to their card. When they found the correct piece and joined them together, it revealed an image and a word. 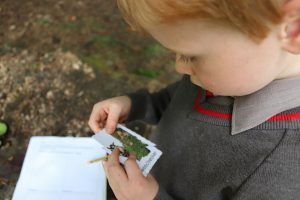 The class then grabbed clipboards to draw and spell out the woodland creature. Form 1 and Form 2 set off on a multi-sensory trip around the school. We have the largest grounds of the Ilkley primary schools so we made sure we used ALL of it in this lesson! Pupils picked up sticks then wrapped elastic bands around them. Starting from the back field, pupils walked over the grass, over to the trees, across the path and then to the campfire. As they walked, the children thought about what they could see, hear, smell and touch. 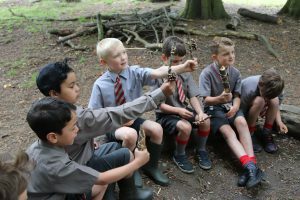 The children added pieces from the woodland floor to their sticks by tucking them under the elastic band. By the end of the lesson, each child had a uniquely decorated stick to show their journey. Form 3 and 4 were next up for their Eco School lesson. 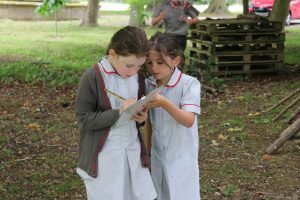 Their task was to find out more about the different animals found in the woods. In pairs the children searched for clues to their assigned animal in order to complete their worksheet. 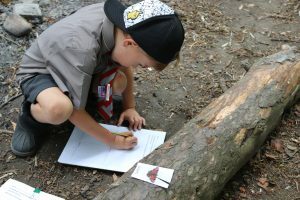 The children looked for facts about the animals’ sleeping patterns, diets and features which could be found under rocks, behind trees and on campfire logs. Finally, Form 5’s session involved combining trees with tech! The class were the first to try out the Woodland Trust’s British Tree ID app. The app talks you through identifying a tree by examining its features. In pairs, Form 5 chose from one of the hundreds of trees growing in Ghyll Royd’s grounds and examined it using the app. 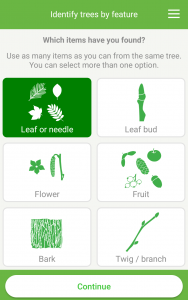 Once identified, the app reveals facts about the trees which the class then wrote down on their worksheets. Thank you to Mel for all your hard work and encouraging so many children to get outdoors! A representative from the Woodland Trust will return for another Eco Schools Day on Wednesday 14th November 2018. Will Ghyll Royd be the first Ilkley primary to reach Platinum?